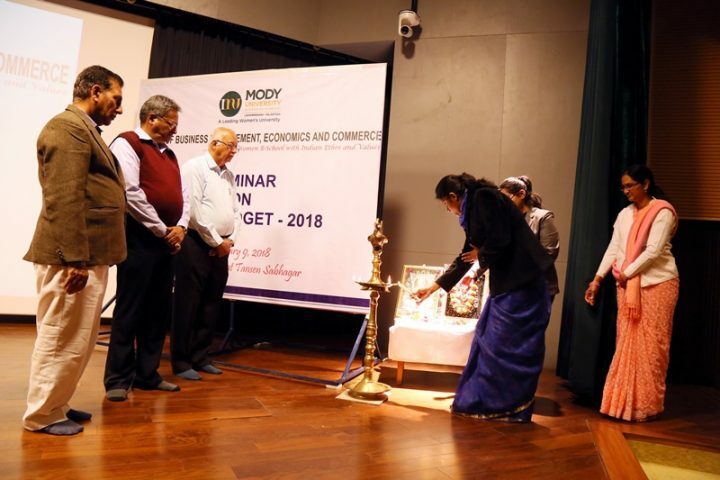 A one-day Seminar onAnnual budget 2018-19 was organized by College of Business Management, Economics and Commerce (COBMEC), Mody University of Science and Technology (MUST) at the University campus on 9th Feb, 2018. The seminar was held to discuss the salient features of the recent budget, its pitfalls as well as its advantages. The seminar had speakers presenting papers both from the faculty as well as the students. The seminar altogether had 14 speakers talking about various aspects of budget including gender issues, infrastructure, banking, digital marketing, tax implications, tourism, health and social front among host of other subjects. 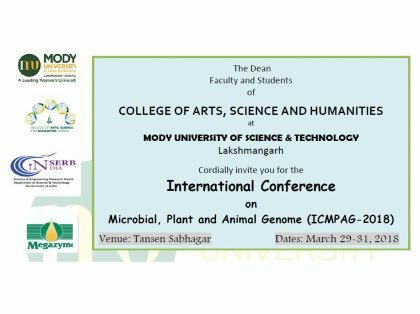 Lauding the efforts of COBMEC, Dr. D.K. 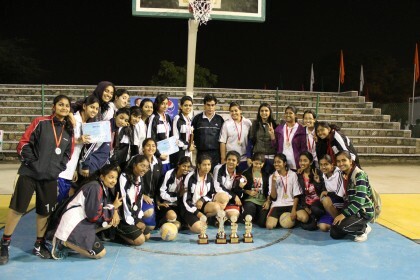 Agrawal, Dean, COMBEC, said he was happy with the enthusiasm showed not just by the faculty members of the department but also the students. Talking about the budget, Dr. D.K. Agarwal said that the budget this year was mainly focused on employment, healthcare and agriculture. Dr. B.S. Rathoreanalyzed the budget through “Gender Lens” and talked about the increase of free gas and electricity connections exclusively for women and the increase of paid maternity leave from 12 weeks to 26 weeks. Dr. Rajesh Sharmatalked about Infrastructure Consolidation and said that the government this year has mostly concentrated on rural infrastructure as a country’s economic growth largely depends on it.Dr.S.S Rajpurohit stressed on the importance of connecting the rural economy with the urban and spoke how India will benefit from the same.Mr. Sumit Kulshrestha talked about the economic engines and analyzed the budget from three dimensional aspects i.e. the good, bad and ugly. 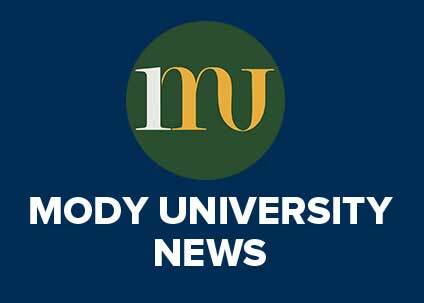 Dr. Manish Didwania shared his views regarding the tax implications announced by the Finance Minister, Mr. Arun Jaitley in the union budget 2018.Dr. D. Suresh Kumar talked about the benefits of the budget from the perspective of a common man.Dr. Pradeep Kautish analyzed the budget from the perspective of Digital Marketing Landscape. 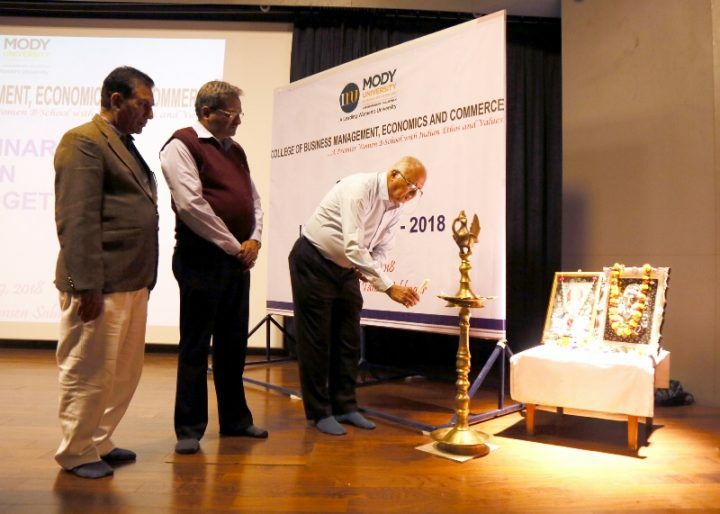 Dr. Ashish Sharmasaid that the government focusing on “Make in India” has made prices of imported goods much expensive from the next fiscal year. He stated some examples on luxury products like cosmetics, high-end cars and iPhones. He also stated that while imported goods would become expensive, this will not have any impact on a middle class income group because the aspirations of the middle class group are different from the rich class. 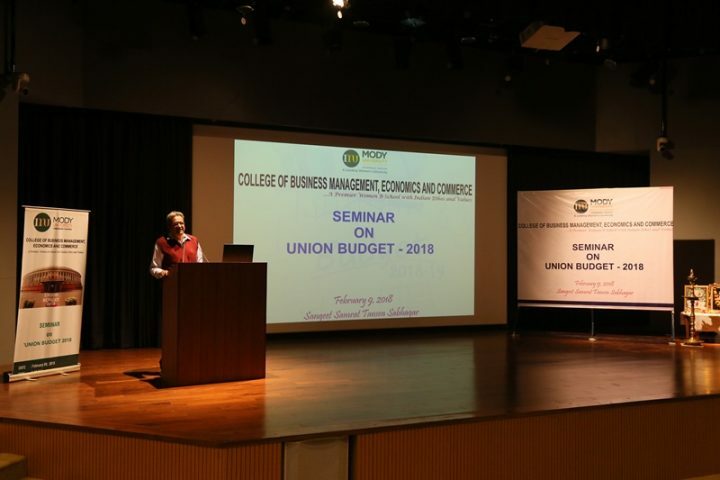 Dr. Sunita Vermahas discussed the impact of union budget 2018 on Human Resource Development from macro perspective and focused on the schemes launched by government to facilitate the educational sector. Dr. Priyanka Jain discussed the direct and indirect effects of infusing of funds in varied sectors in union budget 2018 and its impact on banking sector. She has also emphasized on the three dimensional approach of banks i.e. participation, adoption and acceptance for the materialization of opportunities in near future.Dr. Divya Mathur has presented the snapshot of budget with reference to Tourism and discussed about the existing and future perspectives in this sector. Ms. Kavya, Ms. Ghanisha and Ms. Ankita (students COBMEC) discussed the budget implications from varied aspects i.e. health sector, social front and business organizations.Overall the seminar was quite informative and interactive and provides the students a new dimension for the analysis of budget.